Folksong, whether clearly invoked or implied, is an influence in several of the pieces. Most obviously in Kristo Matson‘s Three Estonian Folk Songs, a strangely-structured work – the middle ‘song’ is so blink-and-you’ll-miss-it that it hardly counts – and perhaps a little too simplistic for its own good, but with some pretty moments, particularly in the opening song. Piret Rips-Laul‘s Paradisi Gloria is similarly simple, and regarding the album as a whole feels like the odd one out, more redolent of the sugary choral styles so prevalent in the US, tapping into a harmonic world not unlike Morten Lauridsen’s but without the scrunchy diatonics. Also with a folk sensibility, but greater invention and beauty, is Maria Kõrvits‘ work for female choir Haned-luiged (Geese-Swans), essentially homophonic but here and there enriched with sustained chords behind, while Mariliis Valkonen‘s Usalduse jõgi (River of Trust) widens the scope of such simplicity, combining relatively rigid underpinning (via drones) with a mixture of unified declamation and bursts of more textural music. Many of the works on this disc have love as a central theme. In Near by Evelin Seppar, setting texts by Elizabeth Barrett Browning, it’s implicit rather than stated (Seppar’s partner conducts the choir for whom it was written), though the work’s strong upward movements that coalesce around the phrase “mystic shape”, and the overwhelmingly passionate outpouring heard later, answered by a soft, heartfelt conclusion, make the subtext abundantly clear. Born in 1958, Toivo Tulev is the elder statesman here, and not simply in terms of age: Tulev has acted in the role of composition teacher for four of the other featured composers. Though the two movements from his 2007 vocal cycle Sonnets are unfortunately marred by an imperfect recording (afflicted with a low hum), the stirring melancholy that Tulev wrings from Dante’s La vita nuova is crystal clear. First the choir laments and consoles itself as a kind of close-knit support group, before turning outwards in a more emotionally raw episode that benefits from sounding intuitive, the contrast between loud, high outbursts and sustained softer passages making this arguably the most direct music on the disc. Four pieces are outstanding and deserve special mention. Tõnu Kõrvits‘ setting of portions from the Song of Solomon – given the wonderfully tongue-twisting title Laulud laulude laulust (Songs of Song of Songs) – embraces folk trappings while attaining quantities of both solemnity and ecstasy that perfectly capture the ardent love in the text, punctuated by some lovely cadential moments acting as short pauses for reflection, or simply an occasion to bathe in feeling. I Am A River, by Helena Tulve – another major figure in Estonia’s new music scene, who has also mentored several of these composers – is the longest work on the disc, and it’s more experimental in terms of both the deployment of voices as well as its harmonic palette. The tonal ambiguities and complicated textures in her setting of words by Rumi come across as more emotionally potent due to these same complications and ambiguities, given some clarity in the glorious eruptions and, later, quiet meditative music that all combine to convey a kind of sustained rapture. Gorgeous. Mirjam Tally‘s astounding Sinu vari (Your Shadow) employs a restrained electronic part of miasmic drones and gentle singing bowl sounds as a backdrop for what is essentially a piece of choral ambient music, which in conjunction with the choir’s sporadic phrases and exhalations establishes a tone of zen-like stillness that’s both peaceful and cathartic. For me, though, the most impressive and memorable work on the disc returns to the kind of folk-like simplicity i mentioned before. Kärt Johanson‘s Õhtu ilu (Beauty of the Evening) takes a fragment of overheard melody and turns it into a cycling mantra – somewhat like Taizé chant – continually re-harmonised and -coloured by the choir. Passing through a wide variety of degrees of intensity, there’s something genuinely magical about this piece; one senses it could go on forever, as inwardly enthralled as it is outwardly mesmerising. Amazing music. Not only does this disc testify to the imagination of the composers, but also to the singing quality of the eight different choirs involved, all of which display levels of accuracy and subtlety that go way beyond being merely impressive. 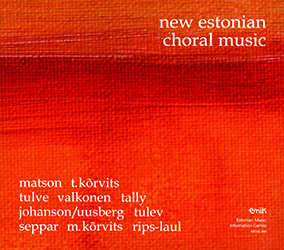 As i’ve stated previously, choral music is arguably the idiom for which Estonia should be most loudly lauded, and this disc makes it abundantly clear why that’s the case. 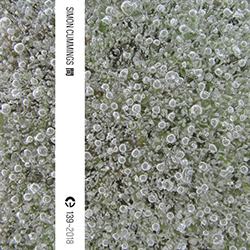 On a new release from Ondine, Tõnu Kõrvits gets a disc all to himself, showcasing his large-scale work for choir and strings, Moorland Elegies. Kõrvits has turned to the poetry of Emily Brontë in order to create what he describes as “a journey into the darkest, most mysterious corners of loneliness: to where one doesn’t bare to peek twice”. 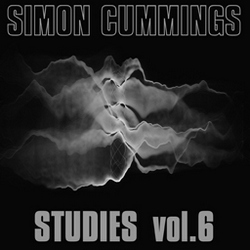 His approach is neither to construct an over-arching narrative nor to explore a vast, multi-faceted soundscape. 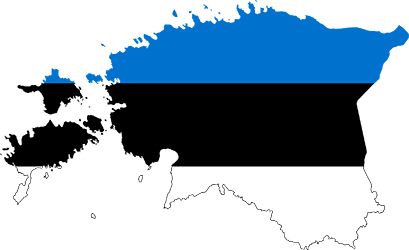 Instead, Kõrvits creates a world that’s fittingly enclosed, not exactly claustrophobic but nonetheless with very definite limits on both its purview and mode of expression. i’m not sure i’ve ever heard anything quite like it. The opening movement, ‘Come, Walk With Me’, is a paradigm of the work as a whole: there’s seemingly something conventionally neo-romantic, even rather cheesy, at the heart of this music, yet sufficiently (dis-)coloured and distorted that it becomes weird and unsettling, all the more so due to the lilting triple metre that makes it feel like a lush yet haunted dance. An extended string epilogue reinforces the weirdness, the intimacy of Brontë’s text made to feel as though directed to a memory or a ghost. This sets the tone marvellously for the rest of the work, which exhibits this same unsettling blend of light, cheerful and uplifted material continually and fundamentally troubled, blanched and turned on its side. It works heavily in the music’s favour that Kõrvits hasn’t set out to create music that aspires to the stuff of real gothic nightmares; the work is much more nuanced and subtle than that, and while on numerous occasions one senses a filmic quality to the music, in this instance it surely says more about the ways film scores borrow from contemporary musical experimentation than the other way round. Comfortable harmonies and a sense of unity are militated against by soft collapses into clusters in ‘The night is darkening round me’ (featuring a lovely solo from alto Marianne Pärna), whereas ‘She dried her tears and they did smile’ is set like a relatively simple song that’s surrounded by forces alien and threatening, both in terms of material and behaviour, leading to a network of final overlapping “oh”s that constitute one of Moorland Elegies‘ most truly spine-chilling moments. There’s a return to the world of eerie dance allusions in ‘The starry night shall tidings bring’, the choir initially stuck on a single pitch as though quasi-catatonic, to the accompaniment of an undulating sequence of string swells (with faint echoes of Jerry Goldsmith); despite later developments, Kõrvits keeps the harmonies essentially fixed and static, creating a kind of stupified, psychologically-deluded version of the imaginary ride through the air in Richard Strauss’ Don Quixote. At last, everything breaks down in the final movement (‘Month after month, year after year’), in which the clarity of melody and the obfuscation of cluster directly collide; the result, though extremely beautiful, is bleak and full of the profoundest melancholy, which continues to poke and prod away at the music despite attempts (as at first) to present something of a brighter nostalgic hue. The ending is judged to perfection, the choir coming to ‘rest’ (if that’s the right word) in a way riven with uncertainty: happy? sad? quietly unhinged? Most likely all three. 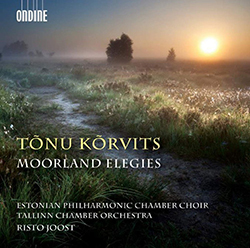 Moorland Elegies is treated to a marvellously vivid rendition in this recording by the Estonian Philharmonic Chamber Choir and the Tallinn Chamber Orchestra, conducted by Risto Joost. Its continual fluctuating between comfort and disquiet is highly stimulating, undermining the music’s superficial beauty in order to project something very much more intimately personal and damaged. Highly impressive. When i wrote yesterday that Galina Grigorjeva had composed some of the best choral music i’d ever heard, it was this disc i was thinking of. 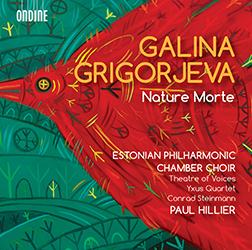 Released a few months back, also on Ondine and again featuring the Estonian Philharmonic Chamber Choir, directed here by Paul Hillier, Nature Morte brings together six works by Grigorjeva, all but one for chamber choir. As noted above, the influence of folk music is evident here too. In the six movements of Svjatki it’s channelled to create, among other things, a fanfare (‘Slava!’, “Glory!”), a convoluted circling around a single point (‘Svjatii Vecher’, “Holy Evening”) and a boisterous choral crowd where the singers keep falling over each other (‘Khristu Rozdjënnomu’, “To the Newborn Christ”). More involving are ‘Oy Kalyudka!’ (“O, Kalyudka!”), in which bustling mass activity creates underlying turbulence that manifests on the surface in exuberant gestures, shaped into lengthy chant-like progressions – and leading to a thrilling final climax – and the delicate tenderness of ‘Chto Nastanet Vesna’ (“Spring Is Coming”), a lyrical melody soliloquising over a drone, spawning a multitude of subsidiary imitative lines, the wondrous combined effect as though reflected in a hall of mirrors. Elsewhere, in the Diptych for male choir and her setting of In paradisum, Grigorjeva opts for a kind of rich, solemn joy, the latter informed by an interested tendency towards roaming harmonies, the former concerned with near-stasis (clearly informed by Orthodox music), explored in a slow-burning, stately way that along the way generates great intensity. As a nicely incongruous touch, the disc includes Grigorjeva’s solo recorder piece Lament, which in the large acoustic of Tallinn’s Niguliste Church sounds magnificent, moving from plangent outpourings to frantic repetitive sputterings, driven on by necessity but not remotely stable. The instrument comes to resemble a will-o’-the-wisp, disappearing into the shadows leaving echoes as its only trace. All very fine pieces, but two others, the 2013 Salve Regina for vocal quartet and string quartet and the title piece, Nature Morte for mixed choir (2008), are yet more outstanding. In the Salve Regina (performed here by Theatre of Voices and Yxus Quartet), Grigorjeva creates a series of harmonic ‘rooms’ that the music moves through. On the one hand, it betrays some qualities of chant, but sufficiently sublimated that the music is liberated from the trappings of a liturgical text, soaring in a way that packs a potent emotional wallop. Nature Morte, setting a text in English by Joseph Brodsky, goes even further in this respect, fully abandoning all trappings of religious solemnity. The opening movement is carried along on a texture of burbling individual voices (perhaps reflecting the ‘passers-by’ in the text), Brodsky’s words all but swallowed up in the mayhem, even more so in the enormous dissonant climax that cuts through its centre. The words are then swallowed up in a different way, erased in a blur of humming and a chilling loud exhalation, embellished with unidentifiable rustlings. This is followed by what is, to date, Grigorjeva’s greatest achievement, ‘The Butterfly’, an utterly electrifying expression of bliss and agony in contemplation of the existence and ephemerality of life. A delicate melody is continually unwound, passed gingerly from singer to singer, borne upon a cushion of sustained chords. Considering that neither the poet nor the composer are English, the immense immediacy and emotional depth and transparency of the words in this movement is simply extraordinary. The work ends with ‘Who are you?’, a text imagining Mary introspectively contemplating the nature of Jesus in the wake of his execution. Grigorjeva has here created her most broodingly heavy music, personal and laboured; nonetheless, she finds a way to enable the piece to blaze with an impossible brightness at its apex, before closing in serene tenderness, encapsulating the duality of Brodsky’s text, the music embodying both the mortal and the divine. An unequivocal masterpiece, it’s the high point of a fantastic disc that proves Arvo Pärt really shouldn’t keep getting all the glory. All three of these discs, in fact, testify to what’s really going on in choral music in Estonia. It’s music we should all be taking seriously and start getting to know a lot better. Much to explore here; most tempting for me right now is the all-Kõrvits album, given that I live a stone’s throw from “Brontë Country”. That said…I know one shouldn’t be too literal-minded when it comes to cover art, but I’ve been up on the moors round here innumerable times and never seen them looking like that…!